Potatoes made this way are perfect when you are entertaining, especially for large meals like on Thanksgiving and the holidays. Having one course done and waiting for you is an excellent way to make hosting, cooking, and feeding a large group a lot easier. These potatoes get the creamy taste from the cream cheese and sour cream. If you would like, you could saute a chopped onion and some minced garlic in 1/3 cup butter until tender. Once cooked and cooled, add it to the sour cream. If you plan to add these fresh bits of onion and garlic, then be sure to omit the onion powder and garlic powder as directed in the recipe. Keep the potatoes delightfully and safely warm in the crockpot on the serving table for up to two hours. Cook the potatoes in large pot of boiling salted water until they are tender, which is about 20 to 30 minutes. Drain the potatoes in a colander, return the potatoes to the dry pot. Shake over low heat for about 1 minute. This helps make the potatoes fluffy as it drives off excess moisture. Then, mash the potatoes until there are no lumps. Beat in the cream cheese, sour cream, onion powder, salt, pepper, and egg. 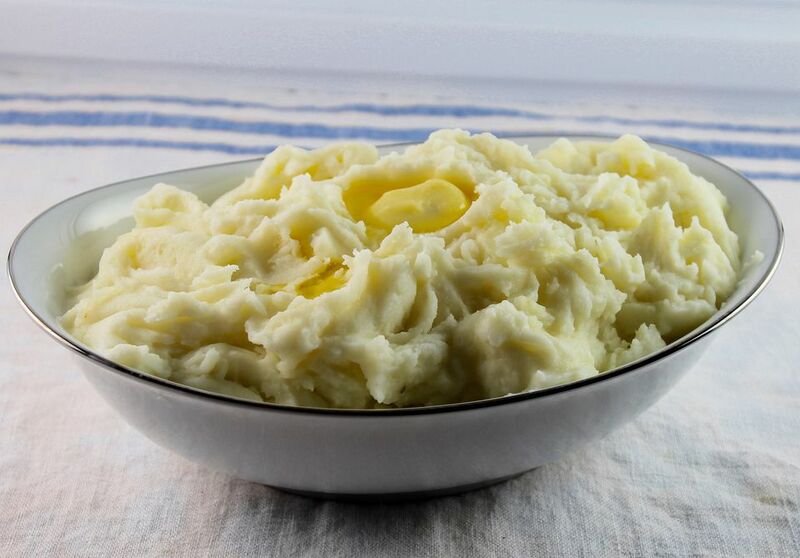 Place the mashed potatoes in a greased 9 x 13 baking dish. Melt the butter and drizzle over the potatoes. Cool for 20 minutes, then cover and refrigerate up to three days. Take the potatoes out of the refrigerator about 3 1/2 hours before serving time. Stir the potato mixture well. Remove the potatoes from the dish and place it in a 4- or 5-quart crockpot. Cover and cook on low heat for 3 to 4 hours, stirring once or twice. You can add more melted butter or some cream or milk if you want a softer consistency. The potatoes can be held in the slow cooker an additional 30 minutes or more on low. Or, turn the crockpot to "keep warm" for another hour or two, if necessary. Easier cleanup: Try using a liner in your slow cooker for easier cleanup. Dairy-free potatoes: You can also cook the potatoes in chicken or vegetable broth instead of using sour cream, cream cheese, and butter. Cook entirely in the crockpot: Instead of boiling the potatoes to start in a separate pot, you can cook these potatoes from start to finish in the slow cooker. It will take longer, but, if you would prefer to "set it and forget it," this is a good option. Add your potatoes, milk for a cooking liquid (about 1 1/2 cups), put in your spices, and set on high for 4 to 5 hours. Add the butter and other dairy ingredients at the end.